At the end of September, I had the great privilege to visit the Chatham Islands as a guest of the Moriori people and part of a 50-strong delegation of officials and peace activists from New Zealand and overseas. We went to renew the Moriori code of non-violence and passive resistance and, in that special way, “bless” the World March for Peace and Nonviolence that began in Wellington on 2 October 2009 and will end in Argentina three months later. Just 600 people live on this remote island and the smaller Pitt Island, located 90-minute flight to southeast of Wellington, New Zealand. Known as Rekohu in Moriori and Wharekauri in Māori, the islands were first inhabited more than 500 years ago by Polynesian settlers related to Maori who became known as Moriori. Subsisting on sea food (kai moana), the Moriori lived in harmony with the environment and in accordance with a culture based on peace until 1835 when Rekohu was invaded by two Māori tribes (iwi) from the Taranaki region in Aotearoa New Zealand (Ngāti Mutunga and Ngāti Tama). In March 1836, one thousand Moriori men met at the entrance to the island’s huge saltmarsh lagoon Te Whanga to deliberate whether to break the peace covenant that had governed their existence for hundreds of years. Symbolized white albatross feathers, the Moriori peace tradition is a philosophy of nonviolence named Nunuku’s law after the ancient chief who issued the edict. After deliberating for three days the Moriori reaffirmed their intent to abide with the code outlawing warfare. Yet several thousand Moriori descendants are alive and well today; they are scattered across the Chatham Islands, New Zealand and the globe. For the past twenty years, the Moriori have been reviving their culture and rediscovering their identify. 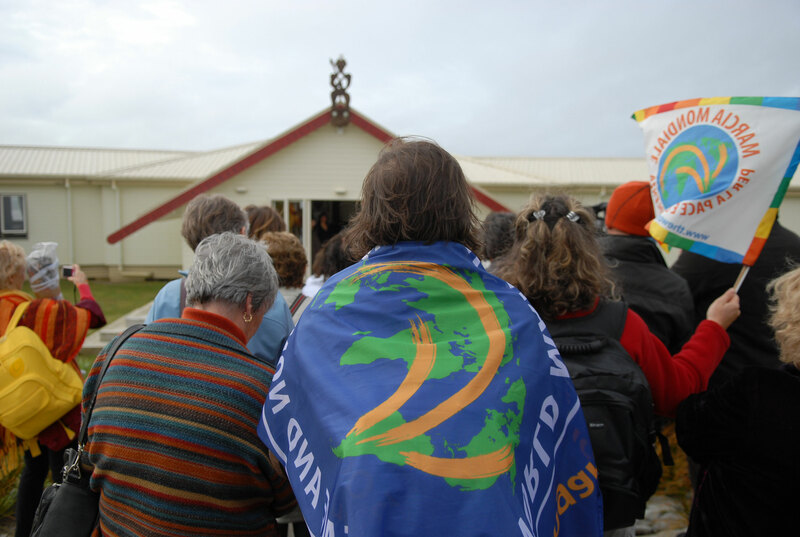 Recent milestones marking this renaissance include the opening in January 2005 of Kopinga marae (a five-sided meeting house for the community) by Prime Minister Helen Clark and the Maori Queen. At Te Papa in June 2008, the New Zealand government or “Crown” gifted $6 million to the establishment of Te Keke Tura Moriori Identity Trust to ensure that Moriori, as a separate and distinct indigenous culture of Aotearoa/New Zealand, is not lost. These efforts have come under the leadership of Tommy Solomon’s grandson Maui Solomon and other Moriori families of the Hikotehi Moriori Trust, which is currently focused on rebuilding the Moriori people’s economic, cultural and social base. Many thanks to Hikotehi Moriori Trust and everyone involved in hosting our delegation, especially Maui, Shirley King, Mana Cracknell, and Susan Forbes. Good luck the international peace marchers and congratulations to Alyn Ware and the New Zealand organizers of the World Peace March. NSP Research – Updates is powered by	WordPress 2.9.2 and delivered to you in 0.111 seconds using 22 queries.